I’m a pretty lazy person. Sometimes making dinner sounds like too much work, I eventually get off my booty and do it, but sometimes you want some convenience. 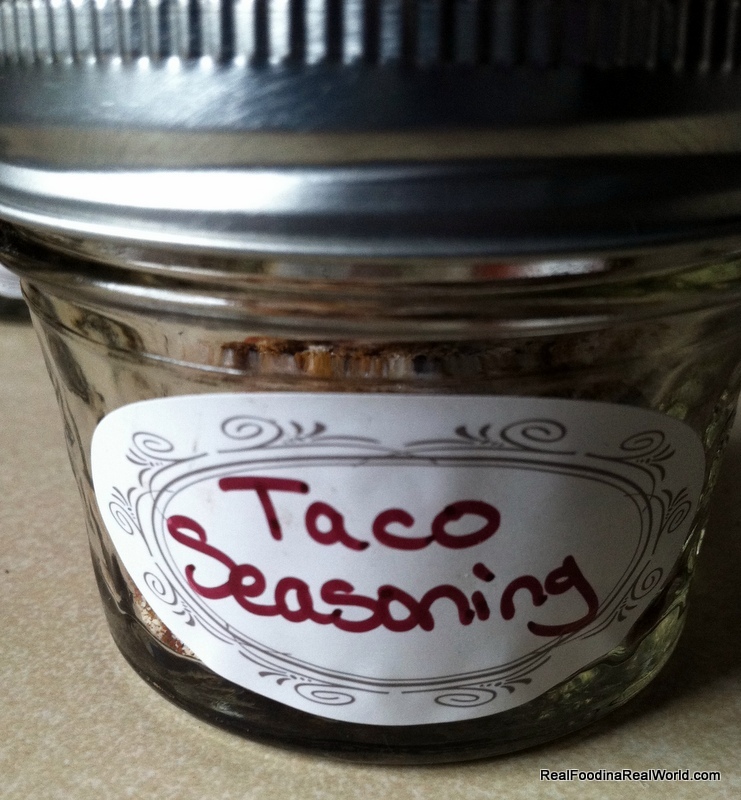 Today’s Homemade Convenience item is Taco Seasoning. Sure, you can walk into the local supermarket and peruse the 987 aisles and find 12 different little packets for taco seasoning. You probably even have a coupon. 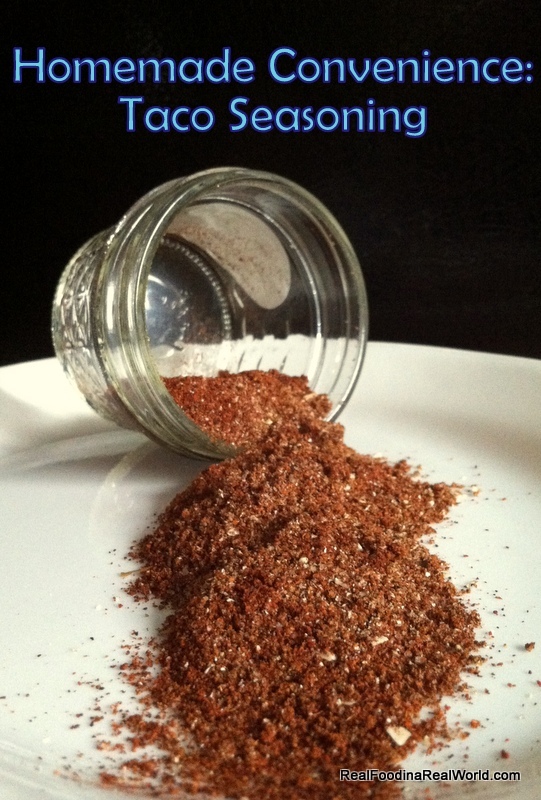 But, I am here to tell you that if you have a decent spice rack, you can make your own at home that tastes a whole lot better and no strange additives. SPICES (INCLUDING CHILI PEPPER, CUMIN, PAPRIKA, OREGANO), ONION, WHEY (MILK), SALT, SUGAR, GARLIC, POTATO STARCH, AND CITRIC ACID. Nothing says authentic Mexican cuisine like some “natural flavor” and caramel color! How easy is it to make your own? 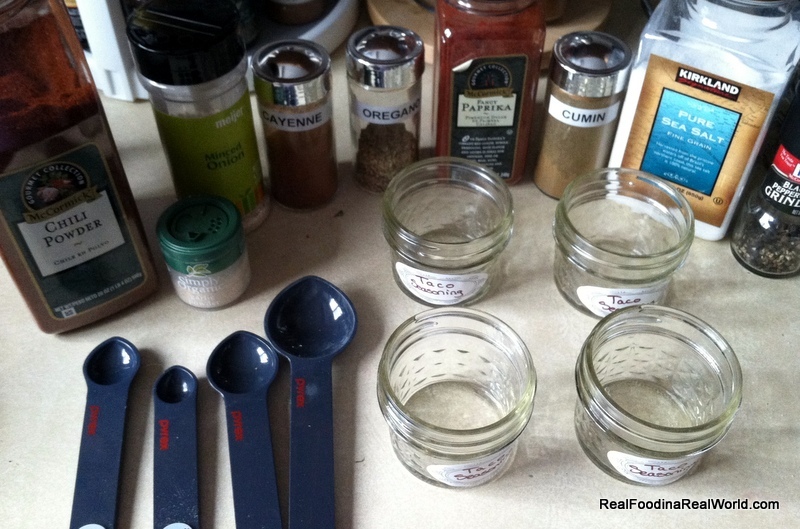 Grab your spice rack, some small jars (I use 4oz canning jars, or glass baby food jars) and some measuring spoons. It will take you about five minutes. I usually make four or five at a time. Use just as you would one of those little packets. For ground beef tacos, I will drain the beef after cooking, add one whole jar of seasoning, about a half cup of water, and simmer until water is absorbed. I highly recommend using your seasoning to make Slow Cooker Chicken Tacos. Disclaimers: I have been making this forever. I’m sure I found a base recipe somewhere, but I have no idea where. It’s such a convenient item to have in the cabinet, hope you enjoy! Excellent photography! By the way, I’m sure you are not lazy. Maybe when you were a teenager your mother MIGHT have said you were lazy, but mommy of toddler = not lazy! :). As lazy as I can be. Thanks! It is so refreshing! It is a great intro to juicing.